A Touch of Tartan: I don't think I have loved a pair of shoes so much in my life!! I don't think I have loved a pair of shoes so much in my life!! The title of this post says it all! There is not much else to be said! Those who know me or have read the blog, know that I have an obsession with anything mint just now. Im just wowed by those shoes! 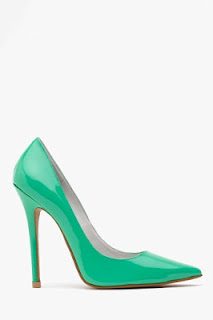 They are bright, sharp, have just the right heel height and are mint fabulous! Dress them up with a nice dress or wear them down with a pair of capri pants or shorts. They are very versatile! I dont think I have ever wanted a pair of shoes so badly! You can see the shoes in more detail here .